Haryana Director General of Police K P Singh has kicked up a controversy with his remarks that common people coming across any miscreant trying to outrage the modesty of a woman or indulging in acts of arson or murder have the right to "take his life". Singh, who was recently made DGP after his predecessor Yashpal Singhal was removed in the wake of severe flak faced by the state police over handling of the Jat stir, said citizens are not aware that they can take action when they come across violations of law. "Common citizens are not aware that this is not just the right which the law gives to policemen only. If the common man is a witness to someone insulting a woman or indulging in acts of arson by burning someone's property or trying to kill a person then the law gives the right to the common man that he can take the life of the person indulging in such acts," DGP Singh said. The DGP expressed these views while taking part in a convention about the role of police in Panchayati Raj in Haryana's Jind on Thursday, where BJP MLA Prem Lata Singh who is wife of Union Minister Birender Singh, was among those present. He stressed that while it is the police's role to maintain law and order, one needs to understand the role of a common man. "It is police's job to maintain law and order but as common citizens you have to understand your role...," he said. Notably, sections 96 to 106 of the Indian Penal Code pertain to the law relating to the right of private defence of person and property. The provisions contained in these sections give authority to a person to use necessary force against an assailant or wrong-doer for the purpose of protecting one's own body and property as also another's body and property when immediate aid from the state machinery is not readily available. With state police drawing flak over its handling of the Jat quota stir in February, DGP Singh said the Haryana Police will not be a mute spectator if any ruckus is created in the future and strict action will be taken against the culprits. In the backdrop of some Jat leaders renewing the threat to start the agitation afresh over their quota demand, the DGP said some people from outside the state are trying to disturb the peaceful atmosphere but it is the duty of locals to keep away from them. "Agitation is right of public but it is wrong when protesters damage the environment by cutting trees and cause damage to public and private property," he said. Notably, the Prakash Singh Committee report which was submitted to the Haryana chief minister recently found "deliberate negligence" on the part of 90 officials, including IAS and IPS officers. On May 17, the Haryana government had shunted out Additional Chief Secretary (Home) P K Das who was replaced by senior IAS officer Ram Niwas. 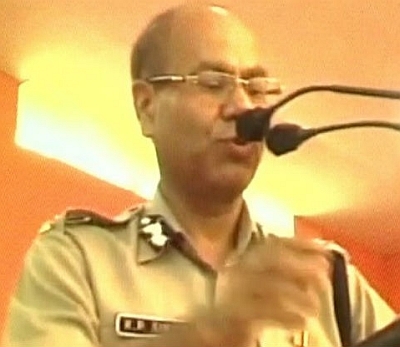 Prior to that, DGP Singhal was replaced by K P Singh. Thirty people were killed in violence and there was extensive damage to property during the stir whose epicentre was Rohtak district. Poll: Android Neyyappam or Naankhatai? Controversy's favourite child, Salman Khan!